Use a palette knife to apply sparkle texture effect through stencil for a raised effect using the image as reference. 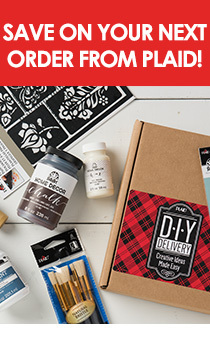 Use Tartan Red and deer stencil artwork and follow general stenciling instructions using the image as reference. Use a foam pouncer, silver foil transfer sheet, transfer adhesive, and stylus and follow transfer sheet instructions using the image as reference. While paint is still wet, carefully peel stencil off. Continue painting areas of the stencil according to your design. Let the paint dry completely before placing another stencil or color over it.